CBD oil is often called hemp oil in marketing material. This labeling offers certain benefits to the companies selling the CBD oil. Chief among the benefits: it reminds consumers (and law officers) that the product being sold derives from hemp rather than cannabis, and is thus legal throughout the European Union and North America. But by calling their product hemp oil these companies are, it could be argued, confusing consumers. This supposed confusion has recently led the “Hemp Industries Association”, the hemp seed oil lobbying group, to write a press release condemning CBD oil companies who engage in the practice of calling their products hemp oil. In the document the HIA urge CBD companies who describe their product as hemp oil to rebrand immediately in order “to remove the market confusion this causes.” They add that “Hemp oil is the common term for hemp seed oil”, and then cite Wikipedia’s hemp oil page as incontrovertible evidence that this must be so. It seems to this humble commentator that hemp seed oil, the extract of the seeds alone, is what requires an urgent rebranding, perhaps to hemp seed oil (which, let’s face it, HIA, is what nearly everyone already calls it). Theirs is the product with the inaccurate name. They are not selling hemp oil they are selling hemp seed oil. 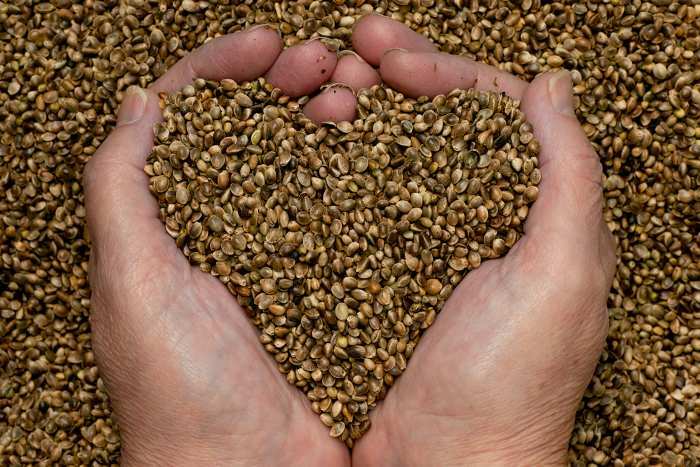 Hemp seed oil is enormously healthy. It’s what I like to think of as an uber-fish oil. It contains the perfect ratio of Omega 3 and Omega 6 for the human body. It recharges the cannabinoid receptors. It’s a substance that works with the endocannabinoid system, and is a valuable and often overlooked part of this miraculous plant. But… it is not correct to call it hemp oil. It is hemp seed oil. Here at Love CBD we choose not to call our product hemp oil, we prefer CBD oil. We do this not to hide that the CBD comes from hemp but because the whole point of this product is the CBD contained within. Surely it’s better to focus on the reason this product exists rather than the general name of the plant itself? Plus, when you start calling your product hemp oil you’re using a term that not only is sometimes ascribed to hemp seed oil, but also a term that Rick Simpson has been using for the last 10-15 years to describe cannabis oil. The phrase “hemp oil” has many different meanings and seems to have become a vague catch-all term for extracts from the cannabis sativa plant. We think it’s better to be as specific as possible. We think of the seed extract as hemp seed oil, high THC extracts as cannabis oil or THC oil, and of high CBD extracts as CBD oil. Seems like common sense to us. Hopefully the HIA will eventually come to the same common sense conclusion. Great article i think that with cannabis becoming so mainstream people really need to be educated on this plant, people think that by ingesting it they understand it when really this is a very complex plant that we are dealing with. Here is to more articles like this and understanding the effects of CBD and Cannabis altogether!